Is your project cumbersome? Let the new SparkFun OpenScale weigh in to handle the stress. Welcome back to another Friday Product Post. Even though we are still recouping after Almost Free Day, we have some new products ready for you! Get a load of these (har har har)! What a load of information! The SparkFun OpenScale is a simple-to-use, open source solution for measuring weight and temperature. It has the ability to read multiple types of load cells and offers a simple serial menu to configure calibration value, sample rate, time stamp and units of precision. Just attach a four-wire or five-wire load cell of any capacity, plug the OpenScale into a USB port, open a terminal window at 9,600bps, and you’ll immediately see mass readings. The SparkFun OpenScale will enable you to turn a load cell or four load sensors in a Wheatstone bridge configuration into the DIY weigh scale for your application. 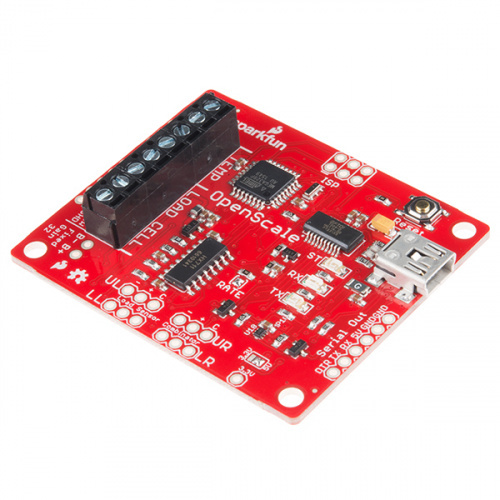 The SparkFun Load Cell Amplifier is a small breakout board for the HX711 IC that allows you to easily read load cells to measure weight. By connecting the amplifier to your microcontroller, you will be able to read the changes in the resistance of the load cell, and with some calibration you’ll be able to get very accurate weight measurements. This can be handy for creating your own industrial scale, process control or simple presence detection. This new version of the amplifier features a few changes that you specifically asked for! We have separated the analog and digital supply, as well as added a 3.3uH inductor and a 0.1uF filter capacitor for digital supply. 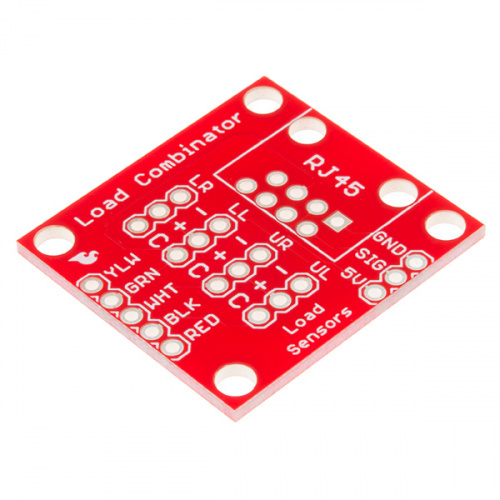 The SparkFun Load Sensor Combinator is a bare PCB that combines four load sensors into a standard four-wire Wheatstone bridge configuration. If you open up an electronic bathroom scale, you’ll find a large rat's nest of wires. The Load Sensor Combinator was created to combine the 12 wires found in a bathroom scale into the standard four-wire Wheatstone bridge. This new version of the combinator features a few changes that you specifically asked for! We updated the silk on the breakout to read "C/+/-" instead of "R/W/B" and moved the temperature sensor connector away from the standoff hole. The old version of the combinator is currently still available and on sale! They are still marked at a special price but will only be available until stock runs out! Alright, folks, that's it for this week. We hope you load up your carts with some of these fancy new products. We'll see you back here next Friday with even more new products! The website is nice, but arabic people can't benefit from site because content is not arabic, so for arabic content about Electronic Circuit, you can find it in Ø§ÙÙØªØ±ÙÙÙÙ Ø¨Ø§Ø¨Ù http://www.electronicbub.com/ Arabs may be benefiting from the electronic circuit, but will not be able to take advantage of explanation and how it works. The old version of the combinator is currently still available and one sale! ONE sale??? Shouldn't that be ON sale? And since I'm typing a comment, one from about 45 years ago seems appropriate: "Heavy, man!"